Derek Jeter doesn’t own a pet, because he’s scared of them. His hero growing up was Dave Winfield, and his favorite food is Chicken Parmesan. He eats peanut butter and jelly sandwiches before each game, and still gets butterflies before going up to bat. These are just a few of the answers to the many questions asked by kids around the country on Tuesday, June 16th when Jeter made an exclusive in-game appearance in the kids’ virtual world, UpperDeckU. To prep for the event, we sold tickets at UpperDeckU, which kids could obtain with Gold Coins in the game. 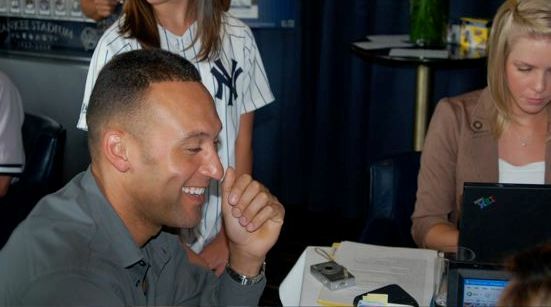 Kids from all over logged in on Tuesday between 2-3pm EST to meet and chat with Jeter online, asking him whatever they wanted. Questions ranged from “Do you hate the Red Sox?” to “What do I do so I’m not afraid of getting hit by the ball?” Derek’s responses were both candid and amusing, especially when asked if he owned any pets. His response shocked many of the kids, as he stated “I don’t own any pets, because they scare me.” Not your typical response, but nonetheless, the kids enjoyed his honesty and answers to all the questions they threw at him during the event. We hosted the online appearance at a restaurant called NYY Steak inside the new Yankee Stadium. The venue was stunning, and we did this in conjunction with a Meet and Greet with Upper Deck winners who collected the complete Yankee Stadium Legacy Set (amounting to a grand total of 6,661 cards!) After Derek met with the winners, it was my turn to switch modes into the online appearance, where kids were anxiously waiting. 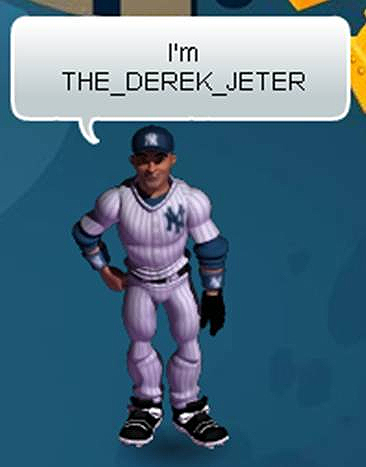 I hosted the appearance as the Club Commissioner, Lisa Mayor, with my co-worker Christine Lee fielding Derek’s responses as his avatar, THE_DEREK_JETER. Derek was curious about all the kids’ players on the large screen in front of him, and asked if these kids were really logged on computers waiting to talk with him. Yup! Derek, these kids have been waiting for a long time to get to chat with you! Once the event started, Derek’s and my avatar appeared in the game, and we were ready for whatever the kids threw our way. We moved to five different rooms in UpperDeckU throughout the event, talking to approximately 50-100 kids at a time. Derek was energetic and enthralled with the entire process and amazed that he was able to chat with all these kids at one time. Overall, his virtual appearance in UpperDeckU was a success, and now we can all rest assured that he’ll continue to stick with baseball, and won’t see him become a veterinarian anytime soon! How Many Injuries Can the Red Sox Suffer? Yankees in Six – Again? The 2009 World Series: Good vs. Evil? Fasntastic Job!! What a great way to introduce athletes to their fans,and give so many fans access to their favotite athlete at one time.Congratulations on this ground-breaking event.Keep up the good work! thanks for great informations It’s a wonderful Your site is very useful for me .I bookmarked your site!